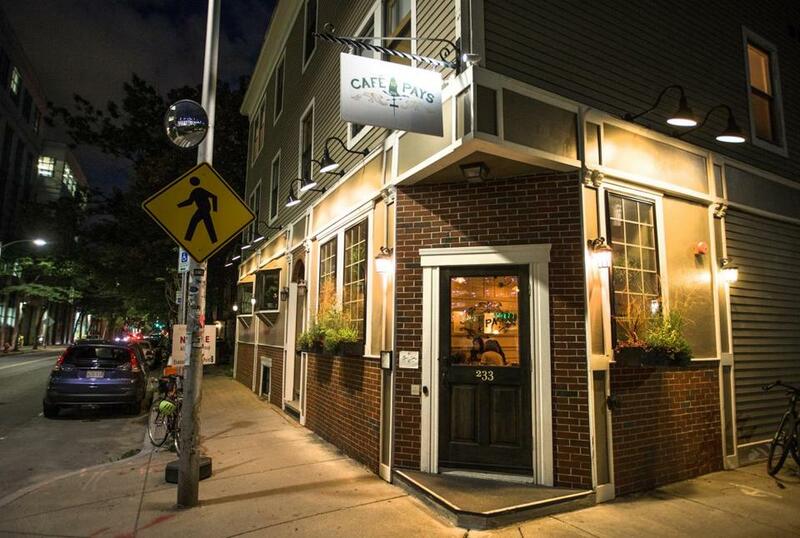 Cambridge’s Café Du Pays has fashioned the lower-level dining area into a cozy lounge. Openings: Colette has opened at Cambridge’s Porter Square Hotel (1924 Massachusetts Ave. at Porter Road), new from the team behind the South End’s Frenchie and Petit Robert. It’s open for breakfast and dinner, with brunch and lunch to follow. Sip wine and nibble steak frites, tarragon chicken, French onion soup, and cannelloni coq au vin. Chef Cyrille Couet comes from the InterContinental Hotel’s Miel and Arlington’s Bistro Duet. More burritos in Davis Square: Los Amigos has replaced the Blue Shirt Café (424 Highland Ave. at Elm Street). The burrito shop has several locations throughout the Boston area. Enhancements: Cambridge’s Café Du Pays (233 Cardinal Medeiros Ave. at Binney Street) has fashioned the lower-level dining area into a cozy lounge, with couches and comfy chairs. This new “salon” area has its own menu, too, with a cheese board and lighter snacks. Temporary closings: North Square Oyster in the North End (5 North Square) is temporarily closed for renovations. It will reopen in six weeks, reps say. Holidays: Bukowski Tavern Cambridge (1281 Cambridge St. at Prospect Street) hosts an anti-Valentine’s Day party on Feb. 14, the title of which is unfit to print in a family newspaper. Drown your sorrows with beer from Braintree’s Widowmaker Brewing and appetizers including “teeny weenies” and an “unhappy meal” (a burger and a can of wine). Guests can also tape photos of exes to a piñata for smashing. The cathartic affair commences at 6 p.m.
Those who are less jaded should pay a Valentine’s visit to Fool’s Errand, name notwithstanding (1377 Boylston St. at Kilmarnock Street). Improv Asylum’s Daniel Hirshfield will tap out impromptu love poems for guests on a vintage typewriter. Just provide him with a word, topic, or phrase — but maybe have a cocktail first.